To be totally frank, the breakdowns of the teams in the Sailor Moon series have always come off as a bit odd to me. First off, we have the fact that Sailor Jupiter is a member of the Inner team, while the planet is an “outer” planet. I suppose I can overlook this discrepancy, though, since there’s no way that Ms. Takeuchi could have known that she would wind up representing every planet when the series first started. Second, there’s the question on where Sailor ChibiMoon fits into all this craziness. The anime (and at least initially in the manga) seems to treat her as a sort of “junior” member of the Inners, which I guess is fair enough. But then she later gets her own team with the absolutely-have-nothing-to-do-with-the-Moon-or-the-future Asteroid Senshi of Sailors Ceres, Vesta, Juno, and Pallas. Third, Saturn. I mean, that should be enough right there. Is she a member of the Outer senshi, or some rogue member totally on her own? In the Infinity Arc (Sailor Moon S) I’d say the latter, but from the Dream Arc (Sailor Moon SuperS) and on, it seems like the former. But then she also seems to be paired up with Sailor ChibiMoon in the manga, so is she an honorary member of the ChibiMoon/Asteroid/Saturn brigade? Who knows. Finally, we’ve got the “original” Outer team of Sailors Uranus, Neptune, and Pluto. Is it pure coincidence, or by design that this team is so much more mature than the Inner team? And why should there be any difference in how they act compared to the other team? So what did he have to say about the two teams? Glad you asked! An office lady, often abbreviated OL, is a female office worker in Japan who performs generally pink collar tasks such as serving tea and secretarial or clerical work. Uranus and Neptune, the two new, mysterious soldiers appearing in this series, are clearly at a whole different level in terms of strength, ability, and commanding presence compared to Moon and her team. To try to explain the dynamics between Sailors Uranus and Neptune and the other five Sailor Soldiers, well, I guess I’d say it’s like a career woman (that’s probably an outdated phrase) and a new office lady (that too) at a company. While all the men in the office continue to hold onto their biases and look askance at her, this office lady who’s been in the company for awhile continues working right along with grace. And then there is this newbie office lady, thinking it’ll soon be her chance to shine, all the while getting scolded by the older woman for still being too naive. And yet, she admire this younger girl. One day, they get assigned to the same project. What starts out as mutual respect turns into rivalry, followed by reconciliation, and then a sense of camaraderie. I’m sure throughout that process, all sorts of situations unfold between these two. Well, at least that’s the kind of situation I’d like to give viewers a glimpse into. 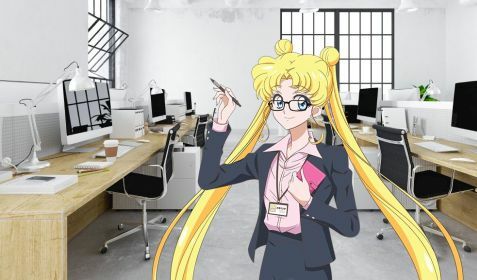 This isn’t the first time that we’ve compared the world of Sailor Moon with the dynamics of Japanese corporate life, and I imagine it won’t be the last. But I have to say, as weird as this sounds, I feel like this description really does give an interesting insight into the relationship between the Inner Senshi and Sailor Uranus and Sailor Neptune, at least in the anime. See? They know how to work together! What do you think of this explanation offered up by the series director? A bit too much on the interpretive side, or maybe he wasn’t successful in getting the image across? For me, personally, I don’t think I would have come to the assumption he outlined here if no one were to mention it to me. However, I can really get a sense of that underlying story element when I look back on the interactions between the teams across Sailor Moon S.
Of course, I love hearing other people’s views on things like this — especially from those who may not necessarily live and work in Japanese corporations. After nearly a decade living in Japan, I kind of lose touch with what’s “normal” in the West, so the fresh perspective is great to have! ← What Shojo Anime Was Predicted to Be the Next Sailor Moon? This sort of makes sense to me. I think in the West we have a similar dynamic and I’ve certainly observed it. You have people who have been working for the company for awhile and they know the office politics and how things get done and while they are aware of the problems of the company, they’ve been there so long that they’ve learned to work around them, instead of try to solve them. And then the newcomer comes onto the scene, very naive, but also very excited and gung-ho about helping out, and they start to point out all of the problems that the more senior people are aware of but have stopped talking about/solving and this tends to create friction. It’s annoying when the newbie acts like they just discovered something that everyone already knows about, and then worse, that they act like they can solve it. But at least the new person cares about the company. And sometimes it takes an outsider to get the senior people out of a rut of accepting problems instead of changing things. 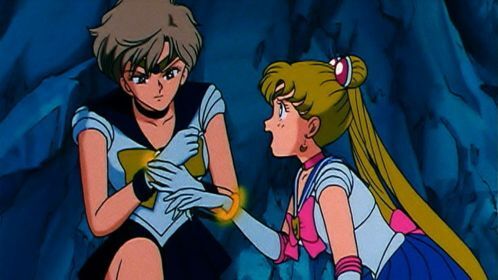 So I could see Usagi being like that– she rejected the whole paradigm of “Saturn has to die to save the world” or “We can’t risk it” and that struck the Outers as extremely naive. And it was, but also, there were other things at play that they couldn’t see but she could. Of topic but I just had to write this: In episode 3 (episode 2 in US I think) in the 90s japanese animation, there is a weird sequence in the end when Tuxedo Mask is laughing. He’s saying goodbye and flying away and he’s laughing like a maniac, it’s a laugh that belongs to a villain! I always burst out laughing at that scene. I’m convinced something went wrong there..
That’s an interesting comparison. I feel that the anime didn’t really take that analogy to any conclusion, though – or, maybe, it did in the third season, but kind of reset the development in Stars. While the Outers are definitely more experienced than Usagi and her guardians, they’re also… er, assigned to the wrong department at the time. They were not supposed to *be* on Earth, and by the time they show up it has become Usagi’s “workplace”. This is why I think their interactions in the manga (where they clearly respect Usagi from the start, but are still bound by their own mission since *they* messed up by letting the enemy arrive on Earth) make more sense than in the anime (where they usually seem to genuinely consider Usagi’s team an obstacle). Which probably makes it less about Usagi being a newbie, and more about the Outers not being used to working on small-scale projects? While a corporate office situation isn’t what would have come to mind for me, I think I understood his point perfectly and it makes a lot of sense. Haruka and Michiru are the pros and they just don’t trust the newbies to handle these really important tasks. But of course the new employees are also well-trained and have their own ideas (often better ones) about how things should be done, so there’s conflict. Definitely true! I think that the whole “corporate life” just so happens to be so deeply ingrained in Japanese society that it makes for a convenient example, though this same sort of phenomena could appear practically anywhere. Regarding the “the absolutely-have-nothing-to-do-with-the-Moon-or-the-future Asteroid Senshi of Sailors Ceres, Vesta, Juno, and Pallas”…. It’s actually sort of perfect that it plays out this way for them in the series. After all…. what can be said about asteroids, if not that they’re just passing through? In most case, that’d probably be true, but in the case of the Asteroid Belt Senshi, all of them have an incredibly stable orbit. In fact, last I checked, Ceres and Pluto are basically considered to be about one-in-the-same (in terms of being either a planetoid or asteroid). But that’s neither here nor there! I still just find the whole concept to be a bit weird. 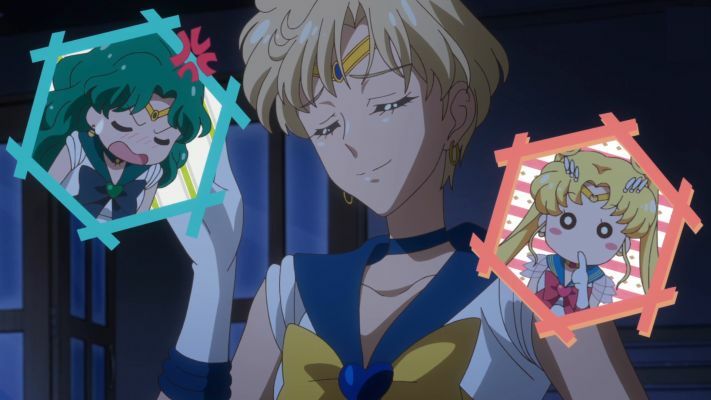 I think the comparison makes more sense if you consider it purely from Usagi’s starstruck point of view (like how the manga seemed to) but the anime seemed to want to spin it as literal fact, because to me it doesn’t really hold up under scrutiny; the whole maturity angle feels very surface level. Where I think this analogy falls apart, at least for the anime, is the Outers being on some kind of superb level above the others is something we’re *told* much more than *shown*, and it’s not even something that lasts for very long. Yes, the Outers have an almost absurdly strong showing at the start — though the Inners suddenly get worse at everything they do was a red flag for me, as it felt like the writers were shilling to give some new unproven characters some quick credibility). I guess some of that is due to their role as secondary characters vs the primary characters needing to ultimately solve problems, because that’s how scripts work, but I always found the implicit hype behind the Outers to be lacking. I guess a better comparison would be two kinds of first-response teams insisting the other should go first. As an addition: Also from the audience point of view the Outers are the ‘new’ team, not the Inners. You can’t really have the viewers be following a team for two years, with no foreshadowing at all of the other, then claim the second one’s exploits (all which occurred off-screen in a nebulous timespan) are suddenly ‘the established team’. One has to remember when discussing the “why is Jupiter an inner planet” is that the term itself is pure Fanon. Unlike the outers, their group name is stated only in the manga and only once: Four Soldiers of the Guardian Gods, or Guardian Senshi, refering to their role as the Princess’ bodyguards. The group officially does not include either Moon as they did not exist in the Silver Millennium. As noted in my reply to your other comment, I absolutely agree that the term “inner senshi” is a fan term. 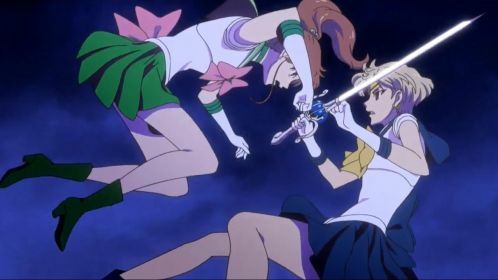 However, “Outer Senshi” (a shortened version of “Soldiers of the Outer Solar System”) is not a fan-created term. The basis if the question is less about why Sailor Jupiter is a member of the so-called “inners” — which, as you mentioned, is not a canon term — and more a question of why she’s not a member of the “outers,” which is canonical.